HCM CITY — Many agricultural export companies have resumed work even before the end of Tết (Lunar New Year). 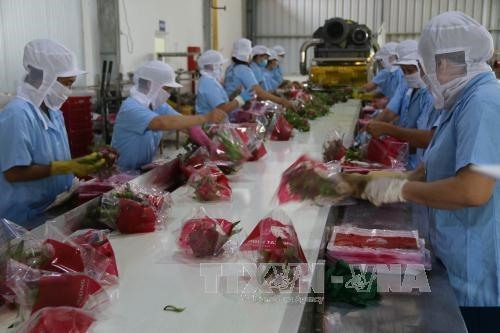 Vina T&T Group’s two processing plants in Chợ Gạo and Cai Lậy districts in the southern province of Tiền Giang began preparations on Friday to ship 23 containers of longan, dragon fruit and coconut to the US. Lavifood recently opened a fruit and vegetable processing factory in Tây Ninh Province and signed contracts to export frozen fruits like mango, dragon fruit and papaya to South Korea at the beginning of the Lunar New Year. “Our factory can process 60,000 tonnes of fruits and vegetables a year,” Đinh Hùng Dũng, its deputy director, said. On Wednesday, the Việt Nam Fruit and Vegetable Association sent a delegation to the German Fruit and Vegetable Fair to explore opportunities, and many German companies have expressed interest. Đặng Phúc Nguyên, general secretary of the association, said: “The Chinese market is becoming more and more difficult with authorities there asking for official exports with traceable origin. It is good to force Vietnamese farmers to achieve VietGAP and Global GAP standards. But it now accepts only eight fruits and vegetables from Việt Nam and the Ministry of Agricultural and Rural Development is negotiating with Chinese authorities to accept more. Besides, Việt Nam’s potential to export fruits and vegetables to developed nations remains huge due to free trade agreements like the Comprehensive and Progressive Agreement for Tran-Pacific Partnership (CPTPP).